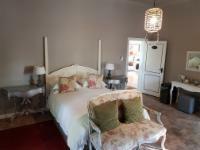 Located in the heart of Beaufort West,Old House Luxury Guest Houseis a well preserved Karoo homestead dating from the early 1900's.It has a serene old world charm and luxury, surrounding its guests withthe warmth of the Karoo hospitality in all its facilities.Old House Luxury Guest Houseoffers well equipped rooms, all designed withyour comfort in mind to make your stay a memorable experience.Relax in the comfortable lounge in front of a cosy fire in winter orenjoy the fresh Karoo air and refreshmentsin the beautiful lavender gardennext to the pool during the summer months.Guests can expect no less than exceptional service,friendly staff, fine food and good wine. Family friendly: We have a Family room for a family of four. Romantic: Candle light dinner in our dining room with fireplace during winter or outside dinner under the stars on a summer night. 1. Any alternations to reservations must please be made in writing. 2. Reservations cannot be confirmed until such time as a registration form has been completed, signed and returned to Old House. Deposit payments are calculated as full accommodation value & payment (of deposit) must be made 30 days prior to arrival. 3. Bookings made... 1. Any alternations to reservations must please be made in writing. 3. Bookings made at shorter notice must be confirmed by full payment within 48hours. 4. Credit Card transactions cannot be processed without a signed authorisation being faxed to Old House. 5. All payments made into our account must be accompanied by your full name and date of reservation as reference. 6. Old House reserves the right to release bookings without notification if these payment conditions are not fulfilled. 7. Guests arriving later than 22h00 will be charged an additional R100. Please let us know if you are going to be late. Stay between 18 Apr 2019 and 30 Apr 2019 and get 15% off. Was a lovely guest house, beautiful rooms but we were not informed our room would be next to one of the busiest roads in town. Could not sleep at all because of the noise. Will next time make sure to ask for a garden room. Manager did apologize. Friendly and helpfull staff. Loved the room and surrounds. Very pleasant breakfast. Best of all was the rain that fell overnight! Awesome place, tastefully decorated. Rooms are beautiful. They do serve breakfast as included and dinner as extra, breakfast was good, dinner, considering the price, was average. I suggest that Old House invest in some good inatumental cd's, as listening to KFM in the dining room spoils the old world charm of this marvelous place. Old House Lodge is 0.8km from the centre of Beaufort West , the nearest airport 184.5km (George Airport).